I have been itching to get started on these. Problem is when I start I dont want to do the other projects that I need to do. Wow, everyone is so busy! I feel like a slug. I'm pretty sure I'm still not at 100% after the stupid pneumonia. I sure hope I can bounce back soon! Love the brown boots Cindy! Finished a baby afghan for charity, but have not taken a picture of it yet. Will do that soon. I've started another baby afghan. Brenda, Those are cute stockings. Yes Gardener made a couple of cuties. Good morning all. It is an amazing 23 degrees warmest it's been in days. Got about 8 rows completed on doll blanket when I realized it was unusually larger than rest of piece yesterday. Sure enough I'd grabbed wrong hook for piece. Frogged those rows and did get 10 rows in before bed. Also finished shoulders on 18" doll dress so I'm moving forward with both projects. Love the little stockings. It's so nice to see new projects for a new year. I'm hoping to be able to make one doll outfit per month... how hard can it be? Gardener, those are very cute stockings. I'm hoping to get some pictures taken this weekend, but I finished the blanket for the first baby doll carrier. I got the top section of the 18" doll dress completed. I need to crochet the arms, but it is a nice second project while I'm working on other stuff. I am not neglecting the need for doll clothes, but I'm getting some of the bigger items out of the way, too. May I ask what size you like for the doll blankets? I might be able to make acouple of those, what yarn do you generally use - WW or SW? I'm looking for blankets that would fit 16 inch baby dolls or 18" Springfield size dolls. I'm not particular about yarn other than it is washable. They can match our blankets with dolls if we run out. You are amazing! Thanks. What ever you do will be appreciated. 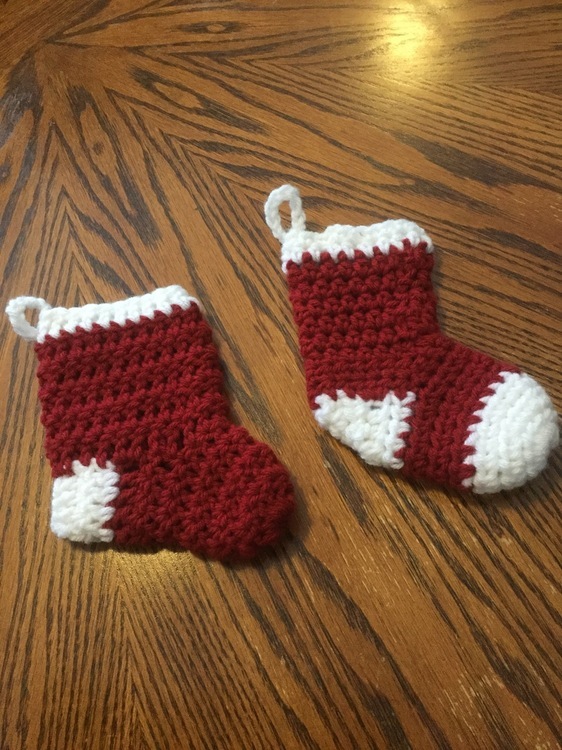 I just want to start by saying I know there are lots of wonderful charities that people crochet for so I am by no means trying to push this toy drive above other projects, but I have had inquires about what is needed so I am going to try to clarify. I've always thought in terms of crochet and knitting as a sister hobby because this is Crochetville. However, this is not a crochet toy drive they take anything toy related. So I'll try to clarify for people who are interested what would be helpful. I'd like to first say you should work in any type of craft form that works for you. I crochet because it works for me. My Mom sends me knitted stuff because it works for her. My Aunt knitted stuff and even made plastic canvas doll shoes one year before she passed on and people loved them. If you prefer to sew believe me it will be welcomed. I often just forget to mention it because again this is Crochetville. Dolls those you make or purchase all are welcome. I am better with bigger dolls but work with a size you enjoy. Doll Cradle Purses or those small doll cradles. I got a small doll/cradle pattern from Annie's for Christmas that I'm hoping to get to this year. I made one cradle purse and I wasn't very good at it, but they make great donations if anyone is interested in making and donating them. Doll blankets knit, crochet, or sew all I ask is that they can be washed and will either fit a 16 or 18" doll or any size you decide to send. Honestly simple works. Large granny squares are fine as long as they are big enough for the dolls. I like exploring new patterns to keep myself interested but simple isn't a bad thing. Home made is a special gift. Doll Diaper bags. These are the size of small project bags and again can be knit, crocheted, or sewn. I suspect plastic canvas might even work. My only request is they have a front pocket. The bags hold all the baby doll clothes, diapers, doll wipes, bottles, doll food, etc. My goal is to help with storage so the doll doesn't become a storage problem. It also enhances the fun play as the girl has a diaper bag for her "baby." I am not a great bag maker so getting these made would be a great blessing for me. Speaking of which Barbie doll clothes. I struggled through Barbie doll clothes for my nieces, but they were no works of art. If anyone makes Barbie clothes, I will make sure we have the dolls to donate with them. I just don't do small anymore. Again knit, crochet, sew doesn't matter all are welcome. One of the ladies from the library knit/crochet group I'm joining mentioned she had missed knitting Barbie clothes since all her grandchildren had outgrown them so I'm working on her to get back into them. Since I mentioned it to her, I thought I'd bring it up here as well. Toy food. I made a box of crochet food a few years ago and it was a HUGE hit. I just haven't had the chance to get back to it again. If anyone enjoys making play food and doesn't have a home for it, they love play food. This includes toy plates, cups, etc. If it works in the kitchen or dining room it fits the theme. Pancakes are simple and a yellow square makes butter. Again crochet, plastic canvas, sewing, anything you make they will use. Ami's this is a chance to get to the boys too. I am really stuck on ideas for boys so if you have something please send it. My focus is the dolls, I just don't have the time to be balanced. If you make anything that is toy related in any craft form it is welcome. As I said I know many of you donate to great charities and this isn't an attempt to divert your efforts. It is an attempt to answer the questions people have asked. I am glad you gave us details. Could you give me approximate dimensions on the blankets. I have no dolls to wrap to see how they fit. I am also interested on approximate dimensions of the diaper bag and pocket. I measured a project bag I have that is about the size of the doll diaper bags I've made in the past since I've never measured them. The bag is bag is 15" wide and about 12" high. The pocket is about 7" x 7" which is a good size. Bigger is fine, smaller would not fit the item that goes in there. The doll blankets are about 20" long and 15" wide. The baby doll blankets tend to be a little bigger as they tuck around, but they all work. Little longer or shorter is not an issue. Mine tend to vary depending on pattern and the edging. Finally starting to get my pictures taken and posted. Today's offering is the doll carrier and blanket. Love this! However...my hands hurt just thinking about crocheting three strands of yarn! Bailey4 that carrier is adorable and I am with Gardener on three strands. I struggle with two. could I make a suggestion if you would like to make a carrier but not with 3 strands of yarn... if you use 2 strands and work the sides with post stitches -FPdc- you will have a very firm tote. We did a CAL here years ago to make a yarn tote that used that technique and it was totally fab. I then used the 2 str/FPdc to make doll bassinets. they sat up straight as you can. Just a thought. Thanks Darski definitely worth experimenting with to try something a bit easier. The second doll afghan is now posted. I've got the grey lady dress finished. It needs all it's accessories and finished items, but it is good to have finished the dress. I also need to start the Valentine bear for my Valentine project. Hi everyone! Sorry I have been MIA again. I am still having problems bouncing back from the pneumonia. Lots of people at work are sick, but still coming to work. It's very frustrating. The "cruds" are just making their second rounds on our floor and I am doing everything I can to stay away from everyone. I get home from work and just deflate. But we have MLK as a holiday, so I hope to enjoy the long weekend because I have 3 days out of 4 next week in training...and yeah, I'm supposed to get my regular work done somehow. Ack. Anyway, glad to see that you guys are keeping up with each other. I went for my "crochet day" with my friend last Saturday and haven't touched a hook since then. I am still working on the C2C project that I started I think back in November. Hopefully I can get something done this weekend even if it's only a hat on the knitting machine. I gotta get some momentum.